An essential ingredient of Bald Eagles breeding habitat is the presence of suitable roost trees within sight of the nest. Our local pair of eagles is no exception, and they favor three or four tall Australian Pines along Pines Boulevard, as well as the trunks of melaleuca trees in the SW Florida Water Management District land just to the west of the proposed City of Pembroke Pines Bald Eagle sanctuary. In an effort to restore the wetlands to a more normal “Everglades,” these exotic trees were all intentionally killed by herbicides a few years ago. They are badly decayed and many fall down with each windstorm. As these roosting sites disappear, we can expect the eagles to seek out other prominent perches, such as power poles. 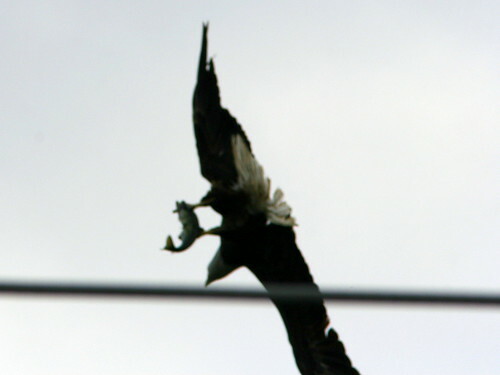 Electrocution and collision with power lines are major causes of urban Bald Eagle mortality. On June 11, Bald Eagle Sanctuary Steering Committee members Barry Heimlich of South Florida Audubon, and veteran eagle watcher Trisha Norton met at the site of the Pembroke Pines nest with Doug Macke, Florida Power & Light Company Broward Area Power Systems Environmental Coordinator, to discuss this hazard. They were pleased to learn that Doug had been observing the eagles since last year, when the nest was first “discovered,” and the company had already taken some action. The Bald Eagle Steering Committee also expressed concern about the possible loss of the roost trees that were nearer to the power lines. FP&L must trim certain branches that may damage the lines and interrupt service during hurricanes. Recognizing that FP&L does have such a responsibility, the Committee members asked, if pruning of the roost trees is necessary, that FP&L might consider selective “directional pruning” rather than removal. According to Trisha’s account of the meeting, “[Doug] explained that the routine trimming occurs in 3 yr cycles and he is going to find out and send us the date of the last trim so we can anticipate the next trimming. He said that when this happens, our input would be welcomed. He also said we would be contacted when it is to be done. He said, in answer to one of your concerns, that FPL does not do the trimming themselves, but hires a tree company, so he felt it very important that we have representation before and during the work.” Doug was also aware that unnecessary disturbances would be avoided during the eagles’ nesting season. All above photos property of Barry Heimlich (c) 2009 and are used with his permission.